This article is about the city in Mexico. For the original Spanish city, see Guadalajara, Castilla–La Mancha. 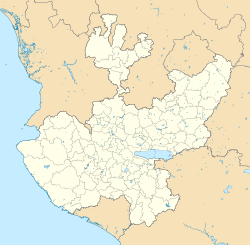 For the province in Spain, see Province of Guadalajara. For other uses, see Guadalajara (disambiguation). Guadalajara (/ˌɡwɑːdələˈhɑːrə/, Spanish pronunciation: [ɡwaðalaˈxaɾa] ( listen)) is the capital and largest city of the Mexican state of Jalisco, and the seat of the municipality of Guadalajara. 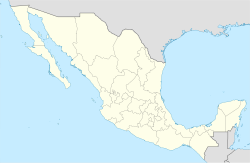 The city is in the central region of Jalisco in the Western-Pacific area of Mexico. With a population of 1,460,148 inhabitants, it is Mexico's second most populous municipality. The Guadalajara metropolitan area has a reported population of 5,002,466 inhabitants, making it the second most populous metropolitan area in Mexico, behind Mexico City. The municipality is the second most densely populated in Mexico, the first being Ciudad Nezahualcóyotl in the State of Mexico. It is a strong business and economic center in the Bajío region. Guadalajara is the 10th largest Latin American city in population, urban area and gross domestic product. The city is named after the Spanish city of Guadalajara, its economy is based on services and industry, especially information technology, with a large number of international firms having regional offices and manufacturing facilities in the Guadalajara Metropolitan Area, and several domestic IT companies headquartered in the city. Other, more traditional industries, such as shoes, textiles and food processing are also important contributing factors. Guadalajara is a cultural centre of Mexico, considered by most to be the home of mariachi music and host to a number of large-scale cultural events such as the Guadalajara International Film Festival, the Guadalajara International Book Fair, and globally renowned cultural events which draw international crowds. It is home to the C.D. Guadalajara, one of the most popular football clubs in Mexico. This city was named the American Capital of Culture for 2005. Guadalajara hosted the 2011 Pan American Games. The city was established in five other places before moving to its current location. The first settlement in 1532 was in Mesa del Cerro, now known as Nochistlán, Zacatecas. This site was settled by Cristóbal de Oñate as commissioned by Nuño de Guzmán, with the purpose of securing recent conquests and defending them against the still-hostile natives. The settlement did not last long at this spot due to the lack of water; in 1533 it was moved to a location near Tonalá. Four years later, Guzmán ordered that the village be moved to Tlacotán. While the settlement was in Tlacotán, the Spanish king Charles I granted the coat of arms that the city still has today. This settlement was ferociously attacked during the Mixtón War in 1543 by Caxcan, Portecuex and Zacateco peoples under the command of Tenamaxtli. The war was initiated by the natives due to the cruel treatment of Indians by Nuño de Guzmán, in particular the enslavement of captured natives. Viceroy Antonio de Mendoza had to take control of the campaign to suppress the revolt after the Spanish were defeated in several engagements. The conflict ended after Mendoza made some concessions to the Indians such as freeing the Indian slaves and granting amnesty. The village of Guadalajara barely survived the war, and the villagers attributed their survival to the Archangel Michael, who remains the patron of the city. It was decided to move the city once again, this time to Atemajac, as it was more defensible. The city has remained there to this day. In 1542, records indicate that 126 people were living in Guadalajara and, in the same year, the status of city was granted by the king of Spain. Guadalajara was officially founded on February 14, 1542 in the Valley of Atemajac. The settlement's name came from the Spanish hometown of Nuño de Guzmán. In 1559, royal offices for the province of Nueva Galicia were moved from Compostela to Guadalajara, as well as the bishopric. Construction of the cathedral began in 1563. In 1575, religious orders such as the Augustinians and Dominicans arrived, which would make the city a center for evangelization efforts. The historic city center encompasses what was four centers of population, as the villages of Mezquitán, Analco and Mexicaltzingo were annexed to the Atemajac site in 1669. In 1791, the University of Guadalajara was established in the city, which was then the capital of Nueva Galicia. The inauguration was held in 1792 at the site of the old Santo Tomas College. While the institution was founded during the 18th century, it would not be fully developed until the 20th century, starting in 1925. In 1794, the Hospital Real de San Miguel de Belén, or simply the Hospital de Belén, was opened. Guadalajara's economy during the 18th century was based on agriculture and the production of non-durable goods such as textiles, shoes and food products. Guadalajara remained the capital of Nueva Galicia with some modifications until the Mexican War of Independence. After Miguel Hidalgo y Costilla decided not to attack Mexico City, despite early successes, he retreated to Guadalajara in late 1810. Initially, he and his army were welcome in the city, as living conditions had become difficult for workers and Hidalgo promised to lower taxes and put an end to slavery. However, violence by the rebel army to city residents, especially royalists, soured the welcome. Hidalgo did sign a proclamation ending slavery, which was honored in the country since after the war. During this time, he founded the newspaper El Despertador Americano, dedicated to the insurgent cause. Royalist forces marched to Guadalajara, arriving in January 1811 with nearly 6,000 men. Insurgents Ignacio Allende and Mariano Abasolo wanted to concentrate their forces in the city and plan an escape route should they be defeated, but Hidalgo rejected this. Their second choice was to make a stand at the Puente de Calderon just outside the city. Hidalgo had between 80,000 and 100,000 men and 95 cannons, but the better-trained royalists won, decimating the insurgent army, forcing Hidalgo to flee toward Aguascalientes. Guadalajara remained in royalist hands until nearly the end of the war. After the state of Jalisco was erected in 1823, the city became its capital. In 1844, General Mariano Paredes y Arrillaga initiated a revolt against the government of President Antonio López de Santa Anna, which the president managed to quell personally. However, while Santa Anna was in Guadalajara, a revolt called the Revolution of the Three Hours brought José Joaquín Herrera to the presidency and put Santa Anna into exile. During the Reform War, President Benito Juárez had his government here in 1856. French troops entered the city during the French Intervention in 1864, and the city was retaken by Mexican troops in 1866. Despite the violence, the 19th century was a period of economic, technological and social growth for the city. After Independence, small-scale industries developed, many of them owned by immigrants from Europe. Rail lines connecting the city to the Pacific coast and north to the United States intensified trade and allowed products from rural areas of Jalisco state to be shipped. Ranch culture became a very important aspect of Jalisco's and Guadalajara's identity during this time. From 1884 to 1890, electrical service, railroad service and the Observatory were established. Guadalajara again experienced substantial growth after the 1930s, and the first industrial park was established in 1947. Its population surpassed one million in 1964, and by the 1970s it was Mexico's second-largest city and the largest in western Mexico. Most of the modern city's urbanization took place between the 1940s and the 1980s, with the population doubling every ten years until it stood at 2.5 million in 1980. The population of the municipality has stagnated, and even declined, slowly but steadily, since the early 1990s. The increase in population brought with it an increase in the size of what is now called Greater Guadalajara, rather than an increase in the population density of the city. Migrants coming into Guadalajara from the 1940s to the 1980s were mostly from rural areas and lived in the city center until they had enough money to buy property. This property was generally bought in the edges of the city, which were urbanizing into fraccionamientos, or residential areas. In the 1980s, it was described as a "divided city" east to west based on socioeconomic class. Since then, the city has evolved into four sectors, which are still more or less class-centered. The upper classes tend to live in Hidalgo and Juárez in the northwest and southwest, while lower classes tend to live in the city center, Libertad in the northeast and southeast in Reforma. However, lower class development has developed on the city's periphery and upper and middle classes are migrating toward Zapopan, making the situation less neatly divided.(napolitano21-22). Since 1996, the activity of multinational corporations has had a significant effect on the economic and social development of the city. The presence of companies such as Kodak, Hewlett-Packard, Motorola and IBM has been based on production facilities built outside the city proper, bringing in foreign labor and capital. This was made possible in the 1980s by surplus labor, infrastructure improvements and government incentives. These companies focus on electrical and electronic items, which is now one of Guadalajara's two main products (the other being beer). This has internationalized the economy, steering it away from manufacturing and toward services, dependent on technology and foreign investment. This has not been favorable for the unskilled working class and traditional labor sectors. On April 22, 1992, gasoline explosions in the sewer system over four hours destroyed 8 km (5 mi) of streets in the downtown district of Analco. Gante Street was the most damaged. Officially, 206 people were killed, nearly 500 injured and 15,000 were left homeless. The estimated monetary damage ranges between $300 million and $1 billion. The affected areas can be recognized by their more modern architecture. Three days before the explosion, residents started complaining of a strong gasoline-like smell coming from the sewers. City workers were dispatched to check the sewers and found dangerously high levels of gasoline fumes. However, no evacuations were ordered. An investigation into the disaster found that there were two precipitating causes. The first was new water pipes that were built too close to an existing gasoline pipeline. Chemical reactions between the pipes caused erosion. The second was a flaw in the sewer design that did not allow accumulated gases to escape. Arrests were made to indict those responsible for the blasts. Four officials of Pemex (the state oil company) were indicted and charged on the basis of negligence. Ultimately, however, these people were cleared of all charges. Calls for the restructuring of PEMEX were made but they were successfully resisted. The city has hosted important international events, such as the first Cumbre Iberoamericana in 1991, the Third Summit of Heads of State and Governments from Latin America, the Caribbean and the European Union in 2004, the Encuentro Internacional de Promotores y Gestores Culturales in 2005, and the 2011 Pan American Games. It was named the American Capital of Culture in 2005, Ciudad Educadora (Educator City) in 2006 and the first Smart City in Mexico due to its use of technology in development. In its 2007 survey entitled "Cities of the Future", FDi magazine ranked Guadalajara highest among major Mexican cities and designated Guadalajara as having the second strongest economic potential of any major North American city, behind Chicago. The magazine also ranked it as the most business-friendly Latin American city in 2007. Under the Köppen climate classification, Guadalajara has a humid subtropical climate (Cwa) that is quite close to a tropical climate, featuring dry, warm winters and hot, wet summers. Guadalajara's climate is influenced by its high altitude and the general seasonality of precipitation patterns in western North America. Although the temperature is warm year-round, Guadalajara has very strong seasonal variation in precipitation. The northward movement of the Inter-Tropical Convergence Zone brings a great deal of rain in the summer months, whereas for the rest of the year, the climate is rather arid. The extra moisture in the wet months moderates the temperatures, resulting in cooler days and nights during this period. The highest temperatures are usually reached in May averaging 33 °C (91 °F), but can reach up to 37 °C (99 °F) just before the onset of the wet season. March tends to be the driest month and July the wettest, with an average of 273 millimetres (10.7 in) of rain, over a quarter of the annual average of about 1,002 millimetres (39.4 in). During the rainy season, afternoon storms are very common and can sometimes bring hail flurries to the city, especially toward late August or September. Winters are relatively warm despite the city's altitude, with January daytime temperatures reaching about 25 °C (77 °F) and nighttime temperatures about 10 °C (50 °F). However, the outskirts of the city (generally those close to the Primavera Forest) experience on average cooler temperatures than the city itself. There, temperatures around 0 °C (32 °F) can be recorded during the coldest nights. Frost may also occur during the coldest nights, but temperatures rarely fall below 0 °C (32 °F) in the city, making it an uncommon phenomenon. Cold fronts in winter can sometimes bring light rain to the city for several days in a row. Snowfall is extraordinarily rare, with the last recorded one occurring in December 1997, which was the first time in 116 years, since it last fell in 1881. The historic downtown of Guadalajara is the oldest section of the city, where it was founded and where the oldest buildings are. It centers on Paseo Morelos/Paseo Hospicio from the Plaza de Armas, where the seats of ecclesiastical and secular power are, east toward the Plaza de Mariachis and the Hospicio Cabañas. The Plaza de Armas is a rectangular plaza with gardens, ironwork benches and an ironwork kiosk which was made in Paris in the 19th century. Within Guadalajara's historic downtown, there are many squares and public parks: Parque Morelos, Plaza de los Mariachis, Plaza Fundadores, Plaza Tapatia, Plaza del Agave, Parque Revolucion, Jardin del Santuario, Plaza de Armas, Plaza de la Liberacion, Plaza Guadalajara and the Rotonda de los Hombres Ilustres, the last four of which surround the cathedral to form a Latin Cross. Construction began on the Metropolitan Cathedral in 1558 and the church was consecrated in 1616. Its two towers were built in the 19th century after an earthquake destroyed the originals. They are considered one of the city's symbols. The architecture is a mix of Gothic, Baroque, Moorish and Neoclassical. The interior has three naves and eleven side altars, covered by a roof supported by 30 Doric columns. The Rotonda de los Hombres Ilustres (Rotunda of Illustrious Men) is a monument made of quarried stone, built in 1952 to honor the memory of distinguished people from Jalisco. A circular structure of 17 columns surrounds 98 urns containing the remains of those honored. Across the street is the municipal palace which was built in 1952. It has four façades of quarried stone. It is mostly of Neoclassical design with elements such as courtyards, entrances and columns that imitate the older structures of the city. The Palace of the State Government is in Churrigueresque and Neoclassical styles and was begun in the 17th century and finished in 1774. The interior was completely remodeled after an explosion in 1859. This building contains murals by José Clemente Orozco, a native of Jalisco, including "Lucha Social", "Circo Político", "Las Fuerzas Ocultas" and "Hidalgo" which depicts Miguel Hidalgo y Costilla with his arm raised above his head in anger at the government and the church. The Cathedral is bordered to the east by the Plaza de la Liberación, nicknamed the Plaza de las Dos Copas, referring to the two fountains on the east and west sides. Facing this plaza is the Teatro Degollado (Degollado Theater). It was built in the mid-nineteenth century in Neoclassical design. The main portal has a pediment with a scene in relief called "Apollo and the Muses" sculpted in marble by Benito Castañeda. The interior vaulted ceiling is painted with a fresco by Jacobo Gálvez and Gerardo Suárez which depicts a scene from the Divine Comedy. Behind the theater is another plaza with a fountain called the Fuente de los Fundadores (Fountain of the Founders). The plaza is in the exact spot where the city was founded and contains a sculpture depicting Cristobal de Oñate at the event (finsemana). The Jalisco Regional Museum (Ex seminary de San José) was built at the beginning of the 18th century to be the Seminario Conciliar de San José. From 1861 to 1914, it housed a school called Liceo de Varones. In 1918, it became the Museum of Fine Arts. In 1976, it was completely remodeled for its present use. The museum displays its permanent collection in 16 halls, 15 of which are dedicated to Paleontology, Pre-History, and Archeology. One of the prized exhibits is a complete mammoth skeleton. The other two halls are dedicated to painting and history. The painting collection includes works by Juan Correa, Cristóbal de Villalpando and José de Ibarra. Between the Cathedral and the Hospicio is the large Plaza Tapatía which covers 70,000 m2. Its centerpiece is the large Quetzalcoátl sculpture/fountain. Southeast of this plaza is the Mercado Libertad, also called the Mercado de San Juan de Dios, one of the largest traditional markets in Mexico. The Temple of San Juan de Dios, a Baroque church built in the 17th century, is next to the market. At the far east end is the Plaza de los Mariachis and the Ex-Hospicio Cabañas. The Plaza de los Mariachis is faced by restaurants where one can hear live mariachis play, especially at night. The Ex-Hospicio Cabañas extends along the entire east side of the Plaza. This building was constructed by Manuel Tolsá beginning in 1805 under orders of Carlos III. It was inaugurated and began its function as an orphanage in 1810, in spite of the fact that it would not be finished until 1845. It was named after Bishop Ruiz de Cabañas y Crespo. The façade is Neoclassical and its main entrance is topped by a triangular pediment. Today, it is the home of the Instituto Cultural Cabañas (Cabañas Cultural Institute) and its main attraction is the murals by José Clemente Orozco, which cover the main entrance hall. Among these murals is "Hombre del Fuego" (Man of Fire), considered to be one of Orozco's finest works. Off this east-west axis are other significant constructions. The Legislative Place is Neoclassical and was originally built in the 18th century. It was reconstructed in 1982. The Palace of Justice was finished in 1897. The Old University Building was a Jesuit college named Santo Tomás de Aquino. It was founded in 1591. It became the second Mexican University in 1792. Its main portal is of yellow stone. The Casa de los Perros (House of the Dogs) was constructed in 1896 in Neoclassical design. On Avenida Juarez is the Sanctuary of Nuestra Señora del Carmen which was founded between 1687 and 1690 and remodeled completely in 1830. It retains its original coat of arms of the Carmelite Order as well as sculptures of the prophets Elijah and Elisha. Adjoining it is what is left of the Carmelite monastery, which was one of the richest in New Spain. Luis Manuel Rojas Building, formerly the seat of the State Justice System's district civil court, today houses the system's Judicial School. As the capital of the state, the city is the seat of the state's government. As a result, state politics have a heavy influence in local decision-making and vice versa. Historically, the mayorship of the city has been a common leaping platform for the state governorship. Additionally, because of the sheer size of the Guadalajara Metropolitan Area vis-à-vis the rest of the state, the city's urban agglomeration—largely dominated and coordinated by the Guadalajara city council—captures 12 of the 20 seats in the state legislature allocated by district. All three branches of the state government are concentrated around the historic city centre, with the Palace of Government, seat of the state executive, immediately southeast of the Cathedral. North, across the Plaza de la Liberación, is the State Legislature Building, and immediately east of the latter is the Supreme Tribunal of State Justice. Like other municipalities in Mexico, Guadalajara is governed by a municipal president, who exercises executive power for three consecutive years. This office is currently occupied by Enrique Alfaro (Movimiento Ciudadano). The legislature has the cabildo, formed by the form chosen by the candidate for mayor, made up of aldermen, who are not elected by the people by direct or indirect voting, but the return happens automatically if the mayor wins. The municipality is divided into five electoral districts for the purpose of election of representatives of the city in the federal legislature. These districts are the VIII, IX, XI, XIII and XIV of the state of Jalisco. The city and the municipality of Guadalajara are essentially co extensive with over 99% of the municipality living within the city limits and nearly all of the municipality urbanized. Urbanization centered on the city spreads out over seven other municipalities; of Zapopan, Tlaquepaque, Tonalá, Tlajomulco de Zuñiga, El Salto, Ixtlahuacán de los Membrillos and Juanacatlán. 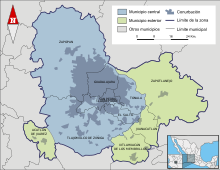 These areas form the "Guadalajara Metropolitan Area" (Zona Metropolitana de Guadalajara in Spanish), which is the most populous in the state of Jalisco and the second most populous in the country after the Mexico City Metropolitan area. This metropolitan area had a population of 4,298,715 in 2008. Guadalajara has the third-largest economy and industrial infrastructure in Mexico and contributes 37% of the state of Jalisco's total gross production. Its economic base is strong and well diversified, mainly based on commerce and services, although the manufacturing sector plays a defining role. It is ranked in the top ten in Latin America in gross domestic product and the third highest ranking in Mexico. In its 2007 survey entitled "Cities of the Future", FDi magazine ranked Guadalajara highest among major Mexican cities and designated Guadalajara as having the second strongest economic potential of any major North American city behind Chicago. 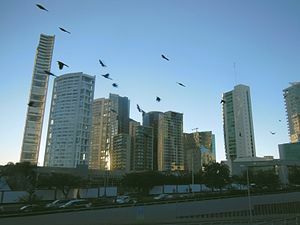 FDI ranked it as the most business-friendly Latin American city in 2007. In 2009 Moody's Investors Service assigned ratings of Ba1 (Global scale, local currency) and A1.mx (Mexican national scale). During the prior five years, the municipality's financial performance had been mixed but had begun to stabilize in the later two years. Guadalajara manages one of the largest budgets among Mexican municipalities and its revenue per capita indicator (Ps. $2,265) places it above the average for Moody's-rated municipalities in Mexico. The city's economy has two main sectors. Commerce and tourism employ most: about 60% of the population. The other is industry, which has been the engine of economic growth and the basis of Guadalajara's economic importance nationally even though it employs only about a third of the population. Industries here produce products such as food and beverages, toys, textiles, auto parts, electronic equipment, pharmaceuticals, footwear, furniture and steel products. Two of the major industries have been textiles and shoes, which are still dynamic and growing. Sixty percent of manufactured products are sold domestically, while forty percent are exported, mostly to the United States. This makes Guadalajara's economic fortunes dependent on those of the U.S., both as a source of investment and as a market for its goods. However, it is the electronics and information technology sectors that have nicknamed the city the "Silicon Valley of Mexico". Guadalajara is the main producer of software, electronic and digital components in Mexico. Telecom and computer equipment from Guadalajara accounts for about a quarter of Mexico's electronics exports. Companies such as General Electric, IBM, Intel Corporation, Freescale Semiconductor, Hitachi Ltd., Hewlett-Packard, Siemens, Flextronics, Oracle, TCS, Cognizant Technology Solutions and Jabil Circuit have facilities in the city or its suburbs. This phenomenon began after the passage of the North American Free Trade Agreement (NAFTA). International firms started building facilities in Mexico, especially Guadalajara, displacing Mexican firms, especially in information technology. One of the problems this has created is that when there are economic downturns, these international firms scale back. In 2007, fDi magazine stated that Guadalajara has the second strongest economic potential of any major North American city, behind only Chicago. The same research noted Guadalajara as a "city of the future" due to its youthful population, low unemployment and large number of recent foreign investment deals; it was found to be the third most business-friendly city in North America. The city has to compete with China, especially for electronics industries which rely on high volume and low wages. This has caused the it to move toward high-mix, mid-volume and value-added services, such as automotives. However, its traditional advantage of proximity to the U.S. market is one reason Guadalajara stays competitive. Mexico ranked third in 2009 in Latin America for the export of information technology services, behind Brazil and Argentina. This kind of service is mostly related to online and telephone technical support. The major challenge this sector has is the lack of university graduates who speak English. Most of the economy revolves around commerce, employing 60% of the population. This activity has mainly focused on the purchase and sale of the following products: food and beverages, textiles, electronic appliances, tobacco, cosmetics, sport articles, construction materials and others. Guadalajara's commercial activity is second only to Mexico City. Globalization and neoliberal reforms have affected the form and distribution of commerce in Guadalajara since the early 1990s. This has led to tensions between traditional markets, such as the Mercardo Libertad, and retailers such as department stores and supermarkets. Local governments in the metropolitan area used to invest in and heavily regulate traditional markets but this is no longer the case. To attract private corporate investment, regulatory control eased and most commercial developments now are controlled by private concerns. The city is the national leader in the development and investment of shopping malls. Many shopping centers have been built, such as Plaza Galerias, one of the largest shopping centers in Latin America, and Andares. Galerías Guadalajara covers 160,000 m2 (1,722,225.67 sq ft) and has 220 stores. It contains the two largest movie theaters in Latin America, both with IMAX screens. It hosts art exhibits and fashion shows, and has an area for cultural workshops. Anchor stores includes Liverpool and Sears and specialty stores such as Hugo Boss, Max Mara and Lacoste. Best Buy opened its first Guadalajara store here. It has an additional private entrance on the top floor of the adjacent parking lot. Another Best Buy store was inaugurated in Ciudadela Lifestyle Center mall, which was the chain's third-largest in the world, according to the company. Andares is another important commercial center in Zapopan. This $530 million mixed-use complex opened in 2008, designed by renowned Mexican Sordo Madaleno architecture firm features luxury residences and a high-level mall anchored by two large department stores, Liverpool and El Palacio de Hierro. The 133,000 m2 (1,400,000+ sq ft) mall offers hundreds of stores, a big food court located on the second floor and several restaurants at the Paseo Andares. Most of Guadalajara's economic growth since 1990 has been tied with foreign investment. International firms have invested here to take advantage of the relatively cheap but educated and highly productive labor, establishing manufacturing plants that re-export their products to the United States, as well as provide goods for the internal Mexican market. A media report in early October 2013 stated that five major Indian IT (information technology) companies have established offices in Guadalajara, while several other Indian IT companies continue to explore the option of expanding to Mexico. Due to the competitiveness in the Indian IT sector, companies are expanding internationally and Mexico offers an affordable opportunity for Indian companies to better position themselves to enter the United States market. The trend emerged after 2006 and the Mexican government offers incentives to foreign companies. Exports from the city went from 3.92 billion USD in 1995 to 14.3 billion in 2003. From 1990 to 2000, socio-economic indicators show that quality of life improved overall; however, there is still a large gap between the rich and the poor, and the rich have benefited from the globalization and privatization of the economy more than the poor. International investment has affected the labor market in the metro area and that of the rural towns and villages that surround it. Guadalajara is the distribution center for the region and its demands have led to a shifting of employment, from traditional agriculture and crafts to manufacturing and commerce in urban centers. This has led to mass migration from the rural areas to the metropolitan area. Line 1 of the Guadalajara light rail/metro system, in the middle of Avenida Colón. The two-line system is partly at ground level and partly underground. Guadalajara is well connected by modern highways to Mexico City, to the northwest and to the major beach resorts of Manzanillo, Mazatlán and Puerto Vallarta. The main highways are Fed 15, which connects the city northwestward to Nogales, Sonora, via Tepic, Nayarit and eastwards to Mexico City via Morelia. Fed 80D leads northwest toward Aguascalientes, and Fed 54D leads southward to the coast via Colima. The city is served by the Don Miguel Hidalgo y Costilla International Airport, also known as Guadalajara International Airport (ICAO code: MMGL) opened in 1966. It is 16 km (10 mi) south of downtown Guadalajara, and it was built on the Tlajomulco de Zuñiga city, way down to Chapala. This airport is the third most active in the country (after Mexico City and Cancún) with direct flights to many Mexican and American cities. Within the city itself, there are many forms of public transportation. The Guadalajara light rail/metro system, named SITEUR (Sistema de Tren Eléctrico Urbano), Spanish for Urban Electrical Train System, provides rapid transit service within Guadalajara and the neighboring municipalities of Zapopan and Tlaquepaque. It consists of two lines: line 1, running from north to south, with 19 stations, and line 2, running from downtown to the east, with 10 stations. The trains are electric and have a top speed of 70 km/h (43 mph). Currently there are 48 articulated cars in service, built in Mexico by Concarril/Bombardier. Construction of a third line began in 2014. Line 3 will run from Zapopan, in the northwest, to Tlaquepaque and Tonalá, in the southeast, via the city centre. The Guadalajara Macrobus is a public transportation system based on the concept of Bus Rapid Transit, where buses run in lanes specifically for them and have stations for boarding. Phase I of the Macrobús project opened in 2009 with a 16-kilometre-long (9.9 mi) corridor following Calzada Independencia and serving 27 stations. The Guadalajara trolleybus system has been operating since the 1970s, and there are private companies operating regular city buses. It also has a bustling network of pedestrianised streets. Mi Bici Pública, PBSC Urban Solutions-based public bike share system, was launched in 2014. In 2016, the city implemented 242 docking stations and 2116 bikes. As of September 2018 Mi Bici has 19,664 annual subscribed users. The average amount of time people spend commuting with public transit in Guadalajara, such as to and from work, on weekdays is 82 min. 23% of public transit riders, ride for more than 2 hours every day. The average amount of time people wait at a stop or station for public transit is 15 min, while 22% of riders wait for over 20 minutes on average every day. The average distance people usually ride in a single trip with public transit is 8 km, and 16% travel for over 12 km in a single direction. Guadalajara was selected as "Smart City" in 2013 by IEEE, the world's largest professional association for the advancement of technology. Several cities invest in the areas of research to design pilot projects and as an example, in early March in 2013 was the first "Cluster Smart Cities " in the world, composed Dublin, Ireland; San José, California; Cardiff, Wales, and Guadalajara, Jalisco, whose objective is the exchange of information and experiences that can be applied in principle to issues of agribusiness and health sciences. The Secretariat of Communications and Transportation also reported that Guadalajara, Jalisco was chosen as the official venue for the first "Digital Creative City of Mexico and Latin America", what will be the spearhead for our country to consolidate the potential in this area. The "Cluster Smart Cities" unprecedented in the world, will focus on what each of these cities is making in innovation and the creation of an alliance to attract technology. The Ministry of Innovation, Science and Technology ( SICyT ) of Jalisco, said the combination of talent development investments allow Jalisco enter the "knowledge economy" . From 25 to 28 October 2015, the city was the venue for the first conference of the Smart Cities Initiative. Guadalajara is an important nucleus of universities and educational centers with national prestige. The most important is the Universidad de Guadalajara, which was established on October 12, 1791 by royal decree. The entity underwent a number of reorganizations since then, but the modern university as it exists today was established in 1925, when the governor of Jalisco convened professors, students and others to re-establish the university. These precepts were organized into a law called the "Ley Organica". It was ranked fifth among the best Mexican universities in 2012. Guadalajara is home to ITESO, a Jesuit university, and has campuses of several private schools such as the Universidad del Valle de México, Tec de Monterrey, Universidad Marista de Guadalajara, Universidad Guadalajara LAMAR, Universidad Panamericana Sede Guadalajara, as well as the Universidad Autónoma de Guadalajara (UAG), which was founded in 1935 and is the oldest private university in Mexico, and Universidad del Valle de Atemajac (UNIVA). In addition, the city hosts The American School Foundation of Guadalajara (ASFG) which has 1420 students in pre-school through twelfth grade; it is the only US-accredited school in Guadalajara. Guadalajara is the cultural center of western Mexico and the second most important cultural center in the country. It is nicknamed the "Pearl of the West". While it is a modern city, it has kept many of the rural traditions of Jalisco, such as mariachi and a strong sense of Catholicism. Cultural tourism is one of the most important economic activities, especially in the historic center. Guadalajara is a center of learning with six universities, two culinary institutes and a thriving art scene. Guadalajara has twenty two museums, which include the Regional Museum of Jalisco, the Wax Museum, the Trompo Mágico children's museum and the Museum of Anthropology. The Hospicio Cabañas in the historic center is a World Heritage Site. For these attributes and others, the city was named an American Capital of Culture in 2005. This city has been the cradle and dwelling of distinguished poets, writers, painters, actors, film directors and representatives of the arts, etc., such as José Clemente Orozco, Dr. Atl, Roberto Montenegro, Alejandro Zohn, Luis Barragán, Carlos Orozco Romero, Federico Fabregat, Raul Anguiano, Juan Soriano, Javier Campos Cabello, Martha Pacheco, Alejandro Colunga, José Fors, Juan Kraeppellin, Davis Birks, Carlos Vargas Pons, Jis, Trino, Erandini, Enrique Oroz, Rubén Méndez, Mauricio Toussaint, Scott Neri, Paula Santiago, Edgar Cobian, L. Felipe Manzano, and (the artist formerly known as Mevna); the freeplay guitarist and music composer for the movies El Mariachi and The Legend of Zorro, Paco Rentería; important exponents of literature such as Juan Rulfo, Francisco Rojas, Agustín Yáñez, Elías Nandino, Idella Purnell, Jorge Souza, among others; classic repertoire composers like Gonzalo Curiel, José Pablo Moncayo, Antonio Navarro, Ricardo Zohn, Carlos Sánchez-Gutiérrez and Gabriel Pareyon; film directors like Felipe Cazals, Jaime Humberto Hermosillo, Erik Stahl, Guillermo del Toro; and actors like Katy Jurado, Enrique Alvarez Felix, and Gael García Bernal. The cuisine is a mix of pre-Hispanic and Spanish influences, like the rest of Mexico, but dishes have their own flavors and are made with local techniques. One of the main distinguishing dishes is birria. This is goat or lamb meat cooked in a spicy sauce seasoned with chili peppers, ginger, cumin, black pepper, oregano and cloves. The traditional way of preparing birria is to pit roast the meat and spices wrapped in maguey leaves. It is served in bowls with minced onion, limes and tortillas. 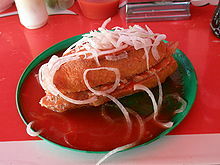 Another dish that is strongly associated with Guadalajara is tortas ahogadas, literally "drowned tortas (sub sandwiches)". This sandwich is an oblong "bolillo" bun (made denser in Guadalajara than in the rest of the country) filled with pork and other ingredients. Then the sandwich is covered in a red tomato/chili pepper sauce. The bread or bolillos mentioned above are usually called birotes in Guadalajara. They are a crusty, dense baguette-style bread similar to that associated with Italy or France and are very different from the soft bolillos found in most of the rest of Mexico. Other dishes that are popular here include pozole, a soup prepared with hominy, pork or chicken, topped with cabbage, radishes, minced onions and other condiments; pipián, which is a sauce prepared with peanuts, squash and sesame seed, and biónico, a popular local dessert. When the Spanish conquistadors arrived in the Aztec empire, a few religious ceremonies included eating pozole made with hominy and human flesh. This was the first type of pozole mentioned in Spanish writing, as a ritual dish eaten only by select priests and noblemen. The meat from the thighs of slain enemy warriors was used. The Franciscan missionaries ended this custom when they banned Aztec religious ceremonies. The pozole in the local common cuisine was related to the ritual dish, but prepared with turkey meat, and later pork, not with human flesh. Jericallas are a typical Guadalajara dessert that is similar to flan, that was created to give children proper nutrients while being delicious. It is made with eggs, milk, sugar, vanilla, and cinnamon, and baked in the oven where it is broiled to the point that a burnt layer is produced. The burnt layer at the surface is what makes this dessert special and delicious. One of the drinks that is popular in Guadalajara is Tejuino, a refreshing drink that contains a corn fermented base with sugarcane, lime, salt, and chili powder. The city hosts the Feria Internacional Gastronomía (International Gastronomy Fair) each year in September showcasing Mexican and international cuisines. A large number of restaurants, bars, bakeries and cafés participate as well as producers of beer, wine and tequila. Mariachi music is strongly associated with Guadalajara both in Mexico and abroad even though the musical style originated in the nearby town of Cocula, Jalisco. The connection between the city and mariachi began in 1907 when an eight-piece mariachi band and four dancers from the city performed on stage at the president's residence for both Porfirio Díaz and the Secretary of State of the United States. This made the music a symbol of west Mexico, and after the migration of many people from the Guadalajara area to Mexico City (mostly settling near Plaza Garibaldi), it then became a symbol of Mexican identity as well Guadalajara hosts the Festival of Mariachi and Charreria, which began in 1994. It attracts people in the fields of art, culture and politics from Mexico and abroad. Regularly the best mariachis in Mexico participate, such as Mariachi Vargas, Mariachi de América and Mariachi los Camperos de Nati Cano. Mariachi bands from all over the world participate, coming from countries such as Venezuela, Cuba, Belgium, Chile, France, Australia, Slovak Republic, Canada and the United States. The events of this festival take place in venues all over the metropolitan area, and include a parade with floats. In August 2009, 542 mariachi musicians played together for a little over ten minutes to break the world record for largest mariachi group. The musicians played various songs ending with two classic Mexican songs "Cielito Lindo" and "Guadalajara". The feat was performed during the XVI Encuentro Internacional del Mariachi y la Charreria. The prior record was 520 musicians in 2007 in San Antonio, Texas. In the historic center of the city is the Plaza de los Mariachis, named such as many groups play here. The plaza was renovated for the 2011 Pan American Games in anticipation of the crowds visiting. Over 750 mariachi musicians play traditional melodies on the plaza, and along with the restaurants and other businesses, the plaza supports more than 830 families. A recent innovation has been the fusion of mariachi melodies and instruments with rock and roll performed by rock musicians in the Guadalajara area. An album collecting a number of these melodies was produced called "Mariachi Rock-O". There are plans to take these bands on tour in Mexico, the United States and Europe. The city is home to a renowned symphony orchestra. The Orquesta Filarmónica de Jalisco (Jalisco Philharmonic Orchestra) was founded by José Rolón in 1915. It held concerts from that time until 1924, when state funding was lost. However, the musicians kept playing to keep the orchestra alive. This eventually caught the attention of authorities and funding was restated in 1939. Private funding started in the 1940s and in 1950, an organization called Conciertos Guadalajara A. C. was formed to continue fundraising for the orchestra. In 1971, the orchestra became affiliated with the Department of Fine Arts of the State of Jalisco. The current name was adopted in 1988, as it became the orchestra for the state, not just the city of Guadalajara although it remains based here. International soloists such as Paul Badura-Skoda, Claudio Arrau, Jörg Demus, Henryck Szeryng, Nicanor Zabaleta, Plácido Domingo, Kurt Rydl and Alfred Brendel have performed with the organization. Today the orchestra is under the direction of Marco Parisotto. The city is also host to several dance and ballet companies such as the Chamber Ballet of Jalisco, the Folkloric Ballet of the University of Guadalajara, and University of Guadalajara Contemporary Ballet. Guadalajara is also known for several large cultural festivals. The International Film Festival of Guadalajara is a yearly event which happens in March. It mostly focuses on Mexican and Latin American films; however films from all over the world are shown. The event is sponsored by the Universidad de Guadalajara, CONACULTA, the Instituto Mexicano de Cinematographía as well as the governments of the cities of Guadalajara and Zapopan. The 2009 festival had over 200 films shown in more than 16 theatres and open-air forums, such as the inflatable screens set up in places such as Chapultepec, La Rambla Cataluña and La Minerva. In that year, the event gave out awards totaling 500,000 USD. The event attracts names such as Mexican director Guillermo del Toro, Greek director Constantin Costa-Gavras, Spanish actor Antonio Banderas and U.S. actor Edward James Olmos. The Guadalajara International Book Fair is the largest Spanish language book fair in the world held each year over nine days at the Expo Guadalajara. Over 300 publishing firms from 35 countries regularly attend, demonstrating the most recent productions in books, videos and new communications technologies. The event awards prizes such as the Premio FIL for literature, the Premio de Literatura Sor Juana Inés de la Cruz, also for literature, and the Reconocimento al Mérito Editorial for publishing houses. There is an extensive exposition of books and other materials in Spanish, Portuguese and English, covering academia, culture, the arts and more for sale. More than 350,000 people attend from Mexico and abroad. In 2009, Nobel prize winner Orhan Pamuk, German children's author Cornelia Funke and Peruvian writer Mario Vargas Llosa participated with about 500 other authors present. Activities include book presentations, academic talks, forums, and events for children. The Danza de los Tastoanes is an event hosted annually on July 25th at the Municipal President’s building, where the folklore dancers perform one of the oldest traditional dances and combat battle performance to honor the combats against the Spanish. The Festival Cultural de Mayo (May Cultural Festival) began in 1988. In 2009, the event celebrated the 400th anniversary of relations between Mexico and Japan, with many performances and exhibitions relation to Japanese culture. The 2009 festival featured 358 artists in 118 activities. Each year a different country is "invited". Past guests have been Germany (2008), Mexico (2007), Spain (2006) and Austria (2005). France is the 2013 guest. The Expo Ganadera is an event hosted annually in the month of October where people from all over the country attend to display the best examples of breed and their quality that is produced in Jalisco. The event also works to promote technological advances in agriculture. The event also has separate sections for the authentic Mexican cuisine, exhibitions of livestock, charreria and other competitions that display the Jalisco traditions. Despite the Guadalajara area historically being an ethnically Caxcan region, the Nahua peoples form the majority of Guadalajara's indigenous population. There are several thousand indigenous language speakers in Guadalajara although the majority of the indigenous population is integrated within the general population and can speak Spanish. The style of architecture prevalent in Europe during the founding of Guadalajara is paralleled in the city's colonial buildings. The Metropolitan Cathedral and Teatro Degollado are the purest examples of neoclassical architecture. The historical center hosts religious and civil colonial buildings, which are noted for their architectural and historical significance and are a rich mix of styles which are rooted in indigenous cultural contributions (mainly from Ute origin), incorporated in the Mozarabic and castizo, and later in modern European influences (mainly French and Italian) and American (specifically, from the United States). The French-inspired "Lafayette" neighborhood has many fine examples of early 20th-century residences that were later converted into boutiques and restaurants. Guadalajara's historical center has an excellent assortment of museums, theaters, galleries, libraries, auditoriums and concert halls, particular mention may be made to Hospicio Cabañas (which dates from the 18th century), the Teatro Degollado (considered the oldest opera house in Mexico), the Teatro Galerías and the Teatro Diana. The Hospicio Cabañas, which is home to some of the paintings (murals and easel) by José Clemente Orozco, was declared a World Heritage Site by UNESCO in 1997. Among the many structures of beauty is the International Headquarters Temple of La Luz del Mundo in Colonia Hermosa Provincia, which is the largest in Latin America. During the Porfiriato the French style invaded the city because of the passion of former president Porfirio Díaz in the trends of French style, also Italian architects were responsible for shaping the Gothic structures that were built in the city. The passage of time reflected different trends from the baroque to churrigueresque, Gothic and neoclassical pure. Even the architectural lines typical of the decades of the 40's, 50's and 60's the Art Deco and bold lines of postmodern architects of the time. Architectural styles found in the city include Baroque, Viceregal, Neoclassical, Modern, Eclectic, Art Deco and Neo-Gothic. Guadalajara is home to four professional football teams; Guadalajara, also known as Chivas, Atlas, C.D. Oro and Universidad de Guadalajara. Guadalajara is the second most successful and the second most followed club in the country, Atlas also plays in the Mexican Primera División, due to their fine football game style of playing, they are known in the country as 'The Academy', hence they have provided Mexico's finest football players, among them: Rafael Márquez, Oswaldo Sánchez, Pável Pardo, Andrés Guardado, and from "Chivas", Javier (Chicharito) Herandez, and Mexico national team's former top scorer Jared Borgetti from Atlas. Atlas also won several Championships on Amateur Tournaments, and first Football Championship of a Guadalajara Team back in 1951. Atlas fans are collectively called La Fiel (the faithful) by themselves; younger followers are gathered as "Barra 51" ; La Barra 51 is a strong organized supporter group. His name recalls Atlas' the year of first championship in the Primera División de México in 1951. Estudiantes was associated with the Universidad Autónoma de Guadalajara A.C.. It played in the Primera División, with home games in the Estadio 3 de Marzo (March 3 Stadium, for the University's 1935 date of founding). They've won also a single Championship back in 1994 as they defeated Santos. The team moved to Zacatecas and became the Mineros de Zacatecas in May 2014. Starting in October 2014, Guadalajara rejoined the Liga Mexicana del Pacífico baseball tournament with the Charros de Jalisco franchise in play at the Athletic Stadium. Charreada, the Mexican form of rodeo and closely tied to mariachi music, is popular here. The biggest place for Charreada competitions, the VFG Arena, is located near the Guadalajara Airport founded by singer Vicente Fernández. Every September 15, charros make a parade in the downtown streets to celebrate the Charro and Mariachi Day. Guadalajara hosted the 2011 Pan American Games. Since winning the bid to host the Games, the city had been undergoing extensive renovations. The games brought in more than 5,000 athletes from approximately 42 countries from the Americas and the Caribbean. Sports included aquatics, football, racquetball and 27 more, with six others being considered. COPAG (the Organizing Committee for the Pan American Games Guadalajara 2011) had a total budget of $250 million USD with the aim of updating the city's sports and general infrastructure. The center of the city was repaved and new hotels were constructed for the approximately 22,000 rooms that were needed in 2011. The new bus rapid transit (BRT) system, Macrobús, was launched in March and runs along Avenida Independencia. The Pan-American village was built around the Bajio Zone. After the Games, the buildings will be used for housing. There are already 13 existing venues in Guadalajara that the games will use, including the Jalisco Stadium, UAG 3 de Marzo Stadium, and the UAG Gymnasium. Eleven new sporting facilities were created for the event. Other works included a second terminal in the airport, a highway to Puerto Vallarta and a bypass for the southern part of the city. Lorena Ochoa, a retired and former #1 female golfer, Formula One driver Sergio Pérez who drives for Sahara Force India F1 Team and Javier "Chicharito" Hernández, a forward who currently plays for West Ham United and the Mexico national team were also born in the city. ^ a b c d "División municipal. Jalisco". Cuentame.inegi.org.mx. ^ Guadalajara official website. Retrieved October 16, 2018. ^ "Diccionario de la lengua española -Real Academia Española". ^ "guadalajarense - Definición - WordReference.com". Word Reference. ^ "Guadalajara, Jalisco". México en Cifras: Información Nacional, Por Entidad Federativa y Municipios (in Spanish). Instituto Nacional de Estadística y Geografía. Archived from the original on June 26, 2015. Retrieved April 14, 2015. ^ a b Consejo Nacional de Población, México; Proyecciones de la Población de México 2005–2050 Archived October 12, 2007, at the Wayback Machine Retrieved on 2008-10-18. ^ a b c d e Consejo Nacional de Población, México; Delimitación de las zonas metropolitanas de México 2005 Archived May 6, 2009, at the Wayback Machine Retrieved on 2008-10-18. ^ Juan Carlos Aceros Gualdron. "Scripta Nova". Ub.es. Retrieved 2010-06-07. ^ "Aumenta la demanda de las oficinas suburbanas en Bajío". elfinanciero. ^ "Estados del Bajío crecen a ritmo asiático: Banamex". informador. ^ "City Mayors reviews the richest cities in the world in 2005". Citymayors.com. 2007-03-11. Retrieved 2010-06-07. ^ a b c d e f g h i j k l m n o p q r s t u v w x y z aa "Enciclopedia de los Municipios de México Estado de Jalisco Guadalajara" (in Spanish). Mexico: Instituto Nacional para el Federalismo y el Desarrollo Municipal. Archived from the original on June 16, 2011. Retrieved January 14, 2010. ^ Kirkwood, Burton (2000). History of Mexico. Westport, Connecticut, USA: Greenwood Publishing Group, Incorporated. p. 62. Retrieved January 13, 2010. ^ a b c Napolitano, Valentina (2002). Migration, Mujercitas, and Medicine Men : Living in Urban Mexico. Ewing, New Jersey, USA: University of California Press. p. 21. Retrieved January 13, 2010. ^ Kirkwood, Burton (2000). History of Mexico. Westport, Connecticut, USA: Greenwood Publishing Group, Incorporated. p. 82. Retrieved January 13, 2010. ^ a b Kirkwood, Burton (2000). History of Mexico. Westport, Connecticut, USA: Greenwood Publishing Group, Incorporated. p. 83. Retrieved January 13, 2010. ^ Sosa, Francisco (1985). Biografias de Mexicanos Distinguidos-Miguel Hidalgo (in Spanish). 472. Mexico City: Editorial Porrua SA. pp. 288–292. ISBN 968-452-050-6. ^ Fowler, Will (1998). Mexico in the Age of Proposals 1821–1853. Westport, Connecticut, USA: Greenwood Publishing Group, Incorporated. p. 41. Retrieved January 13, 2010. ^ Napolitano, Valentina (2002). Migration, Mujercitas, and Medicine Men : Living in Urban Mexico. Ewing, New Jersey, USA: University of California Press. p. 18. Retrieved January 13, 2010. ^ a b "Guadalajara". Encyclopædia Britannica. Encyclopædia Britannica Online. 2010. Retrieved January 14, 2010. ^ Napolitano, Valentina (2002). Migration, Mujercitas, and Medicine Men : Living in Urban Mexico. Ewing, New Jersey, USA: University of California Press. pp. 20–21. Retrieved January 13, 2010. ^ Napolitano, Valentina (2002). Migration, Mujercitas, and Medicine Men : Living in Urban Mexico. Ewing, New Jersey, USA: University of California Press. pp. 23–24. Retrieved January 13, 2010. ^ Napolitano, Valentina (2002). Migration, Mujercitas, and Medicine Men : Living in Urban Mexico. Ewing, New Jersey, USA: University of California Press. pp. 21–22. Retrieved January 13, 2010. ^ Napolitano, Valentina (2002). Migration, Mujercitas, and Medicine Men : Living in Urban Mexico. Ewing, New Jersey, USA: University of California Press. pp. 20, 22. Retrieved January 13, 2010. ^ Dugal, James (1999). "Guadalajara Gas Explosion Disaster". In Disaster Recovery Journal. 5 (3). Archived from the original on 2016-01-02. ^ Eisner, Peter (28 April 1992). "Nine officials charged in sewer-line explosions case". The Tech. Massachusetts Institute of Technology. 112 (22). ^ "The Guadalajara 1992 Sewer Gas Explosion Disaster". Massachusetts: SEMP. 3 May 2006. Archived from the original on 10 February 2009. Retrieved January 14, 2010. ^ "Legal documents pertaining to this case". .umn.edu. Retrieved 2010-06-07. ^ "News on Pemex indictment". Time. 11 May 1992. ^ Kirkwood, Burton (2000). History of Mexico. Westport, Connecticut, USA: Greenwood Publishing Group, Incorporated. p. 206. Retrieved January 13, 2010. ^ "FDi Magazine – Cities of the Future". Retrieved 2010-06-07. ^ "El Niño Arrives on Schedule". Environment Canada. Retrieved February 2, 2013. ^ "NORMALES CLIMATOLÓGICAS 1951–2010" (in Spanish). Servicio Meteorológico Nacional. Retrieved August 30, 2012. ^ "Extreme Temperatures and Precipitation for Guadalajara 1931–2010" (in Spanish). Servicio Meteorológico Nacional. Retrieved January 21, 2013. ^ "NORMALES CLIMATOLÓGICAS 1981–2000" (PDF) (in Spanish). Servicio Meteorológico Nacional. Archived from the original (PDF) on January 30, 2016. Retrieved January 23, 2016. ^ "Klimatafel von Guadalajara, Jalisco / Mexiko" (PDF). Baseline climate means (1961–1990) from stations all over the world (in German). Deutscher Wetterdienst. Retrieved January 23, 2016. ^ a b c d e f g h "Fin de semana en Guadalajara (Jalisco)" (in Spanish). Mexico City: Mexico Desconocido magazine. Archived from the original on February 19, 2013. Retrieved January 23, 2010. ^ "Photo Gallery". Tequilachef.com. Archived from the original on 2010-06-11. Retrieved 2010-06-07. ^ "INEGI Census 2005" (in Spanish). Archived from the original on 2007-03-28. Retrieved 2009-11-23. ^ Jalisco Ministry of Tourism (2009-08-29). "Jalisco Leads in Mexico's Tourism Recovery and Hosts the 2009 North American Leaders' Summit". Leisure & Travel Week. Atlanta, Georgia: 10. ^ a b c Moody's (2008-04-16). "MOODY'S ASSIGNS ISSUER RATING OF A1.MX TO THE MUNICIPALITY OF GUADALAJARA, JALISCO". Info – Prod Research (Middle East). Ramat-Gan. ^ "Cities of the Future". FDi Magazine. ^ a b c d e "Economy". Guadalajara, Mexico: Government of Jalisco. Archived from the original on March 12, 2006. Retrieved January 24, 2010. ^ "El Bosque Industrial Park" (in Spanish). Guadalajara, Mexico: El Bosque Industrial Park. Archived from the original on September 23, 2009. Retrieved January 24, 2010. ^ a b c "Jalisco IT". Guadalajara, Mexico: IJALTI Jalisco. Archived from the original on September 14, 2009. Retrieved January 24, 2010. ^ a b c Norvell, Robin (December 2005). "Guadalajara Winning Back Business from Asia". Circuits Assembly. San Francisco, California. 16 (12): 6. ^ "The enclave economy: foreign investment and sustainable development in mexico's silicon valley". NACLA Report on the Americas. New York. 41 (2): 46. Mar–Apr 2008. ^ a b "fDi Magazine". Retrieved 2010-06-07. ^ Chacón, Lilia (2009-12-15). "Ocupa México tercer lugar en TI regional" [Mexico occupies third place in regional IT]. Reforma (in Spanish). Mexico City. p. 7. ^ a b c Harner, John. "Globalization of Food Retailing in Guadalajara, Mexico: Changes in Access Equity and Social Engagement". Colorado Springs, Colorado: Department of Geography and Environmental Studies University of Colorado at Colorado Springs. Retrieved January 24, 2010. ^ "Nosotros" [Us] (in Spanish). Guadalajara Mexico: Galerias Guadalajara. Archived from the original on January 24, 2010. Retrieved January 24, 2010. ^ a b Eades, J (1987). Migrants Workers and the Social Order. New York: Tavistock Publications. p. 42. ISBN 0-422-61680-X. Retrieved January 24, 2010. ^ Dale Quinn (2 October 2013). "Guadalajara is now an outpost for Indian IT firms". Quartz. Retrieved 3 October 2013. ^ "Passenger Statistics for 2007". Mexico: Grupo Aeropuerto del Pacifico. Retrieved January 24, 2010. ^ "Trenes" [Trains] (in Spanish). Guadalajara, Mexico: Government of Jalisco. Archived from the original on February 15, 2009. Retrieved January 24, 2010. ^ a b May, Jack. "Mexico Says Sí to LRT: Light Rail South of the Border". 1994 Light Rail Annual & User's Guide, pp. 5–7. Pasadena, California (US): Pentrex. ISSN 0160-6913. ^ "Línea 3 del Tren Eléctrico de Guadalajara" (PDF). Línea 3 project website. Secretaría de Comunicaciones y Transportes, Jalisco. 2014. Retrieved 2015-08-10. ^ "Macrobús Tu Ciudad se Mueve en Grande" [Macrobus Your City Moves Big Time] (in Spanish). Guadalajara, Mexico: Government of Jalisco. Archived from the original on May 16, 2010. Retrieved January 24, 2010. ^ "Sistecozome" (in Spanish). Guadalajara, Mexico: Government of Jalisco. Archived from the original on January 23, 2010. Retrieved January 24, 2010. ^ "Once bankrupt, Montreal's Bixi can't keep up with global demand". Retrieved 2016-09-15. ^ "MIBICI | Datos abiertos". www.mibici.net (in Spanish). Retrieved 2018-10-28. ^ "Guadalajara Public Transportation Statistics". Global Public Transit Index by Moovit. Retrieved June 19, 2017. Material was copied from this source, which is available under a Creative Commons Attribution 4.0 International License. ^ "Guadalajara, la primera Ciudad Inteligente" (in Spanish). Mexico City: El Informador. Retrieved October 25, 2015. ^ "Guadalajara, primera 'Ciudad Inteligente' en América Latina" (in Spanish). Mexico City: Mundo Contact. Retrieved April 1, 2014. ^ "Real Universidad de Guadalajara" [Royal University of Guadalajara] (in Spanish). Guadalajara, Mexico: Universidad de Guadalajara. Archived from the original on October 28, 2009. Retrieved January 25, 2010. ^ "Real Universidad de Guadalajara" [University of Guadalajara] (in Spanish). Guadalajara, Mexico: Universidad de Guadalajara. Archived from the original on June 2, 2009. Retrieved January 25, 2010. ^ Ranking Iberoamericano "SIR 2012"
^ "Central Washington University – Study Abroad & Exchange Programs". Central Washington University. Archived from the original on September 9, 2006. ^ "The ASFG". Guadalajara, Mexico: ASFG. Archived from the original on January 27, 2010. Retrieved January 25, 2010. ^ a b Mexconnect staff. "Guadalajara resource page: Jalisco's capital of culture and festivals". MexConnect. Retrieved January 27, 2010. ^ "Museos" [Museums] (in Spanish). Jalisco, Mexico: Government of Jalisco. Archived from the original on April 29, 2008. Retrieved January 27, 2010. ^ "Hospicio Cabañas, Guadalajara". United Nations. Retrieved January 27, 2010. ^ "Las Capitales Americanas de la Cultura" [The American Capitals of Culture] (in Spanish). Retrieved January 27, 2010. ^ a b "Guadalajara Gastronomía" [Guadalajara Gastronomy] (in Spanish). Mexico: Visiting Mexico (SECTUR). Archived from the original on February 11, 2010. Retrieved January 27, 2010. ^ "La Birria" (in Spanish). Archived from the original on July 26, 2009. Retrieved January 27, 2010. ^ "Pozole era preparado con carne humana en época prehispánica" (in Spanish). Retrieved October 1, 2017. ^ "El origen de la Jericalla – Zona Guadalajara". zonaguadalajara.com. Retrieved 2016-11-14. ^ "Qué Comer? | Vive". vive.guadalajara.gob.mx. Retrieved 2016-11-14. ^ Turino, Thomas (Fall 2003). "Nationalism and Latin American music: Selected case studies and theoretical considerations". Revista de Música Latinoamericana. Austin, Texas. 24 (2): 169. ^ a b "16th Encuentro Nacional del Mariachi y la Charrería Historia" [16th National Encounter of Mariachi and Charreada – History] (in Spanish). Archived from the original on July 11, 2009. Retrieved January 27, 2010. ^ a b "Mariachi hace vibrar a Guadalajara" [Marachi makes Guadalajara vibrate] (in Spanish). 2008-09-02. Archived from the original on 2012-01-21. Retrieved January 27, 2010. ^ "México suma a récords otro por mariachis" [Mexico adds another record for mariachis]. CNN Expansion (in Spanish). 2009-08-31. Retrieved January 27, 2010. ^ Informador Redacción (2009-02-28). "Rehabilitación de Plaza de los Mariachis, a cargo de particular" [Rehabilitation of the Plaza de los Mariachis in private hands]. El Informador (in Spanish). Guadalajara, Mexico. Retrieved January 27, 2010. ^ ""Mariachi Rock-O", un nuevo sonido de Jalisco" [Mariachi Rock-O, a new sound from Jalisco]. El Informador (in Spanish). Guadalajara, Mexico. 2009-08-25. Archived from the original on 2009-08-30. Retrieved January 27, 2010. ^ "Orquesta Filarmónica de Jalisco" [Philharmonic Orchestra de Jalisco] (in Spanish). Guadalajara, Mexico: Orquesta Filarmónica de Jalisco. Archived from the original on January 6, 2010. Retrieved January 27, 2010. ^ "22nd Guadalajara International Film Festival". Guadalajaracinemafest.com. Archived from the original on 2010-09-21. Retrieved 2010-06-07. ^ González, Mariño (2008-11-16). "Exhibirán 220 películas en 9 días; 12 mexicanas" [Will exhibit 220 films in 9 days; 12 Mexican]. Milenio (in Spanish). Mexico City. Archived from the original on July 24, 2011. Retrieved January 27, 2010. ^ a b "Feria Internacional del Libro de Guadalajara (FIL)" (in Spanish). Mexico: CONACULTA. Retrieved January 27, 2010. ^ a b "Feria Internacional del Libro de Guadalajara 2009" (in Spanish). Mexico: Monitor Educativo Instituto de Investigación Innovación y Estudios de Posgrado para la Educación. Retrieved January 27, 2010. ^ "Feria Internacional del Libro de Guadalajara" (in Spanish). Mexico: Instituto Mexicano de la Radio. 2009-10-27. Retrieved January 27, 2010. ^ "Fiestas y Tradiciones | Vive". vive.guadalajara.gob.mx. Retrieved 2016-11-14. ^ "Festival Cultural de Mayo" (in Spanish). 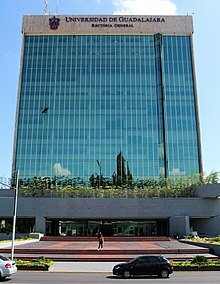 Guadalajara, Mexico: Municipality of Guadalajara. Retrieved January 27, 2010. ^ "Unión Ganadera Regional de Jalisco – Expo Ganadera – Quienes somos". Ugrj.org.mx. Retrieved 2016-11-14. ^ a b "Enciclopedia de los Municipios de México". E-local.gob.mx. Archived from the original on 2006-12-05. Retrieved 2012-12-02. ^ "Chivas, el preferido de México". Infomador. ^ "The official Web site of XVI PAN AMERICAN GAMES". Guadalajara2011.org.mx. Archived from the original on December 20, 2008. Retrieved 2010-06-07. ^ Glover, Michael (June 13, 2009). "Guadalajara Prepares for 2011 PanAmerican Games". Banderas News. Puerto Vallarta. Retrieved January 28, 2010. ^ "Aguilar Teresa". Fomentar A.C. Retrieved 2019-02-01. ^ "Isaac Hernández ; English National Ballet". Ballet.org.uk. Archived from the original on 2014-10-28. Retrieved 2017-03-14. ^ a b c d e f g h i j k l m n o p q r s t u v w x y z aa ab ac ad ae af ag ah ai "Sister Cities, Public Relations". Guadalajara municipal government. Archived from the original on March 2, 2012. Retrieved March 12, 2013. ^ "Sister Cities International (SCI)". Sister-cities.org. Archived from the original on 2015-06-13. Retrieved 2013-04-21. ^ "NOTÍCIAS DO LEGISLATIVO" (in Portuguese). Câmara Municipal de Curitiba. July 24, 2006. Retrieved March 14, 2013. ^ "Sister Cities of Kyoto City". City of Kyoto. Archived from the original on 2014-01-21. Retrieved 2014-01-21. ^ "San Jose, California Gov. (Sister Cities)". Retrieved 2014-02-05. Wikimedia Commons has media related to Guadalajara, Jalisco. Wikivoyage has a travel guide for Guadalajara.